Welcome to our Flower Care & Styling Archive, created to provide you with simple & helpful techniques & tips to keep your Flower Patch flowers looking beautiful as long as possible! If I add Sprite or Pennies to the water of my flowers will they last longer? Cut Flowers require the proper kind and correct amount of nourishment. Floral preservatives are special mixtures of chemicals that have been developed & perfected to prolong the life of flowers. They contain a sugar base to keep the flower’s energy level high, ingredients to inhibit the growth of bacteria and chemicals that lower the pH factor thereby enhancing water uptake. 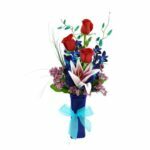 All Flower Patch flowers are treated with professional floral food from the farm to your front door, and are delivered with an extra floral food packet to prolong the life of your bouquet. Home Remedies such as Sprite & Pennies do not contain all the nourishment our flowers need to live their longest and we strongly discourage their use. Should I put my flowers in the refrigerator or freezer when I get home to keep them fresh? Fresh Flowers & Roses should not be placed in either the refrigerator or the freezer! The Refrigerator generally hosts a variety of fruits & vegetables that emit ethylene gases which can shorten the life or even kill your fresh flowers & roses. The Freezer is simply too cold! When fresh flowers & roses are kept at freezing temperatures even for a very short period of time it can result in the discoloration of the flower & premature death. 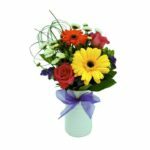 For best results, we recommend all Flower Patch flower bouquets be kept in a well ventilated- cool area of your home or office. Upon Receipt, check water level; add warm water with preservative solution as needed. Keep water level high in vase. Arranging foam should be kept saturated. Display in a cool location, away from direct sunlight. Avoid excessive hot or cold areas. Add water with floral preservative daily. Promptly remove any foliage or flowers that are damaged or beginning to die. 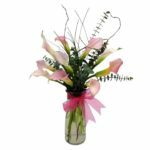 For bouquets not arranged in floral foam, hold the stems of the flowers underwater, using a sharp knife, re-cut one inch from flower stems at an angle every 4 to 5 days to maintain water intake. Remove foliage that will be below water line in vase. Re-cut stems underwater with a sharp knife at an angle. 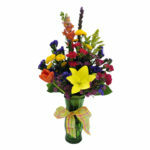 Immediately place in a clean vase filled with warm water & floral preservative. Display in a cool location, away from direct sunlight. Add water with floral preservative daily. Promptly remove any foliage or flowers that are damaged or beginning to die. Hold stems of flowers underwater, using a sharp knife, re-cut one inch from flower stems at an angle every 4 to 5 days to maintain water intake. a)Choose a Container: When choosing a container first consider the room in which it will be displayed. Select something that will compliment the decor. Neutral colored containers or clear glass are safe classics. 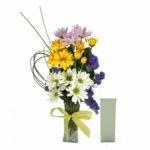 Next, consider the vase opening & height as it must be large or small enough to easily fit all of your flower stems, & tall or short enough to properly display them. 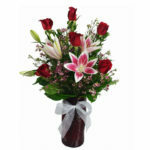 b)Flower Conditioning & Container Preparation: Clean vase thoroughly and fill with warm water and floral preservative. Next, re-cut stems underwater with a sharp knife at an angle, then immediately begin inserting flowers into your container. c)Design Techniques & Tips: For beginners we recommend using foliage or greenery as a base. Begin by inserting your greenery in a circular design, weaving the stems to create a nice secure structure that will hold your main flowers in place. If you are not using greenery, we recommend either weaving the flower stems in the same manner as mentioned above, or gathering them all together evenly and inserting them for a clean trendy look. Next, finish by inserting your main flowers into the greenery base to create your desired shape. 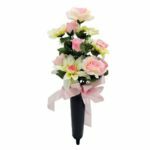 d)Accents: As your floral design confidence increases we recommend trying new product such as river rocks, twine, branches, and other objects from nature to create interest and support to the overall bouquet.